Cambridge English and QS present English at Work: global analysis of language skills in the workplace – a global, cross-industry overview of English language skills at work. The English at Work findings are based on data from over 5,300 employers in 38 countries/territories that completed the annual QS Global Employer Survey, as well as insights from Cambridge English experts. For an overview of the English at Work initial findings, read the executive summary. We asked employers across the world a series of questions about the importance of English in the workplace. Discover the questions we asked them and find out what this means for your country, company size and sector. Use our country comparison to compare countries and regions against the global average. Find out more about using and accepting Cambridge English exams. What percentage of staff have the English skills needed to succeed in their role? What level of English do employers require for tasks at work? What do employers think is the most important language skill? What percentage of employers are planning to improve the English skills of their employees? What English language evaluation methods do employers often use when recruiting new staff? What benefits do organisations offer employees who have a good level of English? Cambridge English and QS present English at Work: global analysis of language skills in the workplace – a global, cross-industry overview of English language skills at work. The English at Work findings are based on data from over 5,300 employers in 38 countries/territories. Use our country comparison to compare countries and regions against the global average. In every industry, there is a gap between the English skills required and the English language skills that employees have. Across all company sizes globally there is at least a 40% skills gap. We work with companies like yours to help identify the level of English required when recruiting new staff. BULATS is a set of workplace English language assessments and training tools. It helps you ensure your employees have the Business English language skills needed to succeed at your company. Our Business English Can Do statements are a helpful summary of the tasks that staff should be able to do at different levels of the CEFR. Sectors such as Banking, Finance and Law have the highest English requirements compared to Travel, Leisure and Hospitality, where employers have lower language requirements. Companies in non-native English-speaking countries have the highest English language requirements – more than 49% require advanced levels of English. Learn about these findings in our executive summary and register to download our full report, with detailed insights of what this means from our Cambridge English experts. We are experts in the English language testing requirements of businesses worldwide. "English is the only language that is globally understood. Having employees with little or no English language skills is a barrier. Overcoming this barrier can only be done by recruiting staff having knowledge of the language." Employers told us that it is important to have proficiency in all four language skills, but the most important is reading, followed by speaking. We have a wide range of English language exams that offer an in-depth test of all four skills. These include our suite of three Business English exams. Cambridge English exams are accepted by over 20,000 organisations worldwide as proof of English language ability. We also offer BULATS, an online workplace test with modules for each of the language skills, so you can quickly test the level of your staff. Across all job roles, employers have plans to improve the English skills of their employees. The focus of this improvement was mainly seen for top and middle management roles. If you are planning to improve the English language levels of your employees, we offer a suite of three Business English certificates. The content in the Cambridge English: Business Preliminary, Vantage and Higher exams is based on everyday work and business tasks, to ensure your employees can use English confidently. How do employers evaluate English language skills when recruiting new staff? "English is the real global language and is important in education, relations and business. I am the Chairman of one of the largest Italian Bank Foundations and we are dealing with more than 100 countries. Our work language is English." Doing more than one check to ensure an employee has proficiency in a range of English language skills is seen as very important. Almost all employers surveyed have at least one method of assessing English language competency. 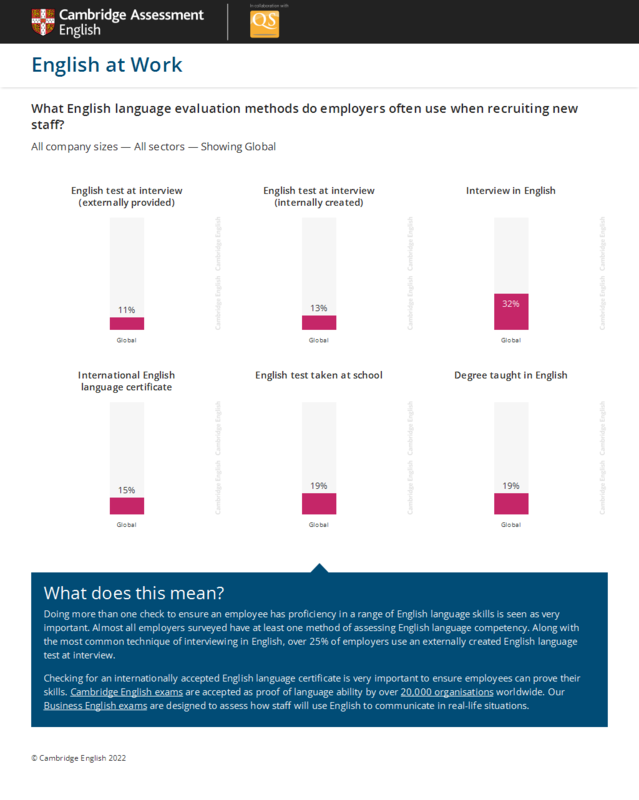 Along with the most common technique of interviewing in English, over 25% of employers use an externally created English language test at interview. Checking for an internationally accepted English language certificate is very important to ensure employees can prove their skills. Cambridge English exams are accepted as proof of language ability by over 20,000 organisations worldwide. Our Business English exams are designed to assess how staff will use English to communicate in real-life situations. Around 50% of employers offer a better starting package to applicants with good English language skills. Having these skills can lead to a faster progression through job grades and a higher salary increase. Better pay and benefits packages are most common in non-native English-speaking countries. Learn more about the benefits for employees in your country in our full report. Register to download the English at Work report and find out what Cambridge English experts say about the findings.